This is the multi-tasking champion in our kitchen! 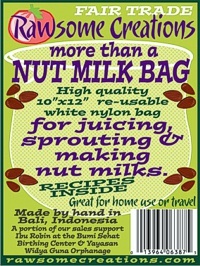 Our flagship products, the More than a NUT MILK BAGs, are reusable. It can be used for nut milks (Rawsome Recipe: Almond Milk) and straining juices. It's so much easier and faster than using a strainer. The drawstring means you can just hang it and let it do its own thing! Our bags come in three weaves – superfine, original, and medium weave – and we offer a Starter Bag assortment consisting of one original (fine weave) bag, and one superfine bag. 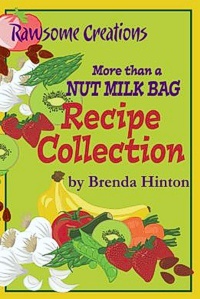 For lots of reasons and ways to use your More than a Nut Milk Bag, check out this page. My Recipe Collection has more than 40 recipes in it, plus a wealth of information about how to make preparation as easy as possible. My kitchen partner Meagan Ricks and I didn't hold anything back. Here's a tour of the book, and a selection of free recipes, and a readers-only section. What else can I do with my More than a Nut Milk Bag? What can I do with the pulp after making milk? I get asked again and again, “How can I make those perfect little round crackers and pancakes?” The idea for the Rawsome Rounds Templates was born out of necessity and a strong desire to offer a quick easy tool to help make kitchen time delicious and fun. As an inventor of uncommon special purpose kitchen tools for vegan and raw food kitchens I asked my team in Bali (where all my products are made) to help with production. A small first order turned into the amazingly successful Rawsome Creations More than a Wrap Template for use with Excalibur Dehydrators. Since then, the product line has grown: a second Excalibur template with 2" wells, and then four Sedona templates, including a ¼" thick 4 well version perfect for personal 5" pizzas. Excalibur templates are food safe acrylic production forms 14 x 14"; Sedona templates are food safe acrylic production forms 14 x 11¾". Except for the Sedona 5" pizza template, all templates are 1/8" thick. Special note: the Sedona templates fit neatly onto Excalibur racks, so if you need the different sizes available in the Sedona line, you can use them in an Excalibur Dehydrator.